"This blazing hot wing recipe is an alternative to deep-fried wings. They are baked instead of fried and stay juicy rather than crisp. I started making these about 5 years ago and they were an instant hit. I am always asked to bring the wings for all the parties we are invited to now." Preheat oven to 400 degrees F (200 degrees C). 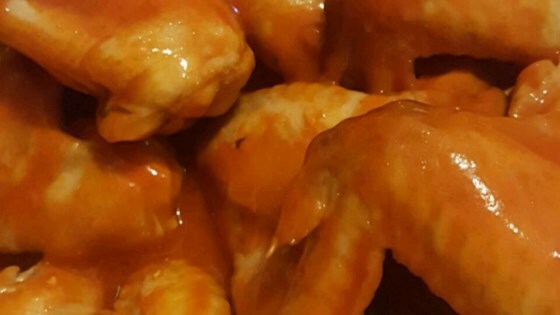 Arrange frozen chicken wings in a single layer in a shallow baking dish. Bake in the preheated oven for 25 minutes, then flip wings. Continue baking until the skin is crispy and meat is no longer pink at the bone, about 20 minutes more. Meanwhile, cook and stir hot sauce, butter, and vinegar in a saucepan over medium heat until butter is melted, about 5 minutes. Add flour; whisk until sauce is smooth. Continue cooking until sauce is thickened, about 5 minutes more. Drain grease from chickens wings and let stand for 5 minutes. Transfer chicken to a large bowl and add sauce. Toss to coat. Was told these were some of the best buffalo wings EVER. Great easy recipe.